They might have had their world turned upside down by Folkestone's earthquake, but the families left temporarily homeless by the tremor are refusing to feel gloomy. At the town's Salvation Army hostel, which is providing sanctuary for those waiting to have their houses assessed by structural engineers, the spirit is likened to that of the Blitz. You might put it down to the spring sunshine outside, but many of the displaced locals are treating their exile as an unexpected holiday. 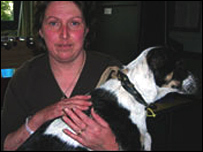 Take Hilary Boorn, 44, who is spending the night at the hostel with husband Frank and dog Phoebe. She was warned that her home was in danger from a neighbour's collapsed chimney and advised to spend the night elsewhere. So far, she has no complaints. "I said to an old lady here - this is what the war must have been like, with everyone taking shelter together. "They've treated me ever so well. There are nurses here asking how you are and making sure you have any medication you might need. "I even had my tea laid on for nothing, and it was ever so nice - sausages, mashed potatoes and peas, with apple pie and ice cream for afters. Lovely. "I can't complain, really. You've got to make the best of these situations." Across the hallway, John Bannon agrees. The 29-year-old window cleaner had crashed out for the night on his sofa "after a few beers" to be woken by soot billowing from his fireplace. He laughs: "I thought it was someone knocking on my door too hard, so I dashed outside to see who it was. And there's everyone in their dressing gowns. "To be honest, it's a bit of a relief coming here. I never get any peace and quiet at home - there are always people coming round to see me, so this is a nice break. "That said, there's nothing like sleeping in your own bed. I'm sure the novelty will wear off pretty quickly." Not all residents of the hostel are so accepting of the situation. Nurse Tilly Ngupe, 44, is less pleased at the prospect of accepting charity to provide a roof over the heads of her two daughters. The bedrooms in her house are all scarred with large cracks and she is waiting to be told whether it is safe to inhabit. "It's not exactly ideal. But then I've not had a minute to get depressed - there's so much to sort out," she sighs. "I've no idea what's going on, or whether I'll be allowed to move back in there, or whether I've got to find somewhere else to live. "When you've got mouths to feed, this is the sort of event that you dread." 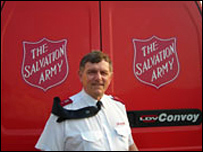 However grim her situation looks, Peter West, an emergency response officer from the Salvation Army, hopes he can at least alleviate it. He was on the scene as soon as news of the earthquake broke, and has helped co-ordinate the logistical feat of catering for the 350 people who have passed through the hostel's doors since then. With "four or five" families expected to need overnight accommodation, he hopes he can make their displacement that little bit more comfortable. "It's a real nightmare for some people, so we're aiming to give them that little bit less to worry about," he says. "That said, I haven't heard many people complaining today - I think everyone's determined to make the best of it. "I often think that you see the best of people in these situations, and when someone shows you generosity and help it does put a smile on your face." Folkestone's new temporarily homeless community will hope that smile is still there in the morning.